If you knit or crochet, you’ve probably seen posts on social media about Little Hats, Big Hearts. It’s a program that joins the American Heart Association and The Children’s Heart Foundation in raising awareness about congenital heart defects and providing resources to encourage family heart health. During the month of February, which is American Heart Month, babies who are born at participating hospitals in the U.S. will each receive a red hat that was made and donated by a volunteer. When I heard about the program, my first step was to contact the office in my state to learn whether they still need hats. I know that knitters and crocheters are often so enthusiastic that organizations end up overwhelmed. I was told that the program is expanding to more hospitals this year, so they still need hats. 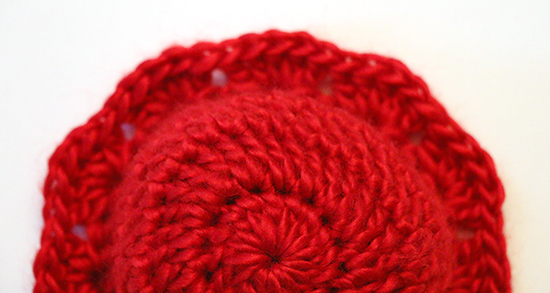 The hats should be made from red cotton or acrylic yarn. Red is the signature color for heart health, while cotton and acrylic can withstand machine washing and drying. I had some Red Heart Shimmer in colorway 1929 Red leftover from a previous project; it’s a (discontinued) worsted weight acrylic yarn with a little bit of sparkle. I was also able to find Lion Brand Landscapes, an Aran weight acrylic yarn, in the color Ruby at a local big box store. Both yarns are incredibly soft, which makes them ideal for baby hats. The Little Hats, Big Hearts webpage offers pattern suggestions, although any pattern may be used. The hats should be made without extras such as pompoms, buttons and bows because they can be dangerous to babies. I made hats from two of the suggested patterns. Creative Preemie Hat by Laura Reavis is a crochet hat with two variations. 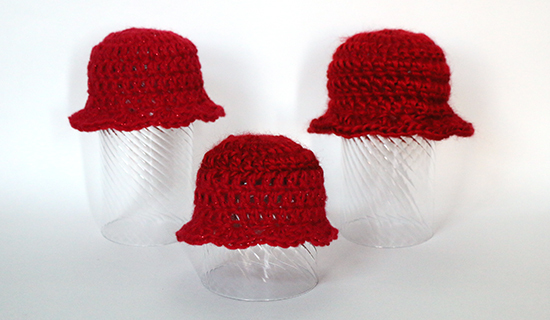 I made one of the main hat, one of the brimless version, and three of the girlie version. For reference, the preemie hats pictured below are on drinking glasses that are about 9 1/2 inches (24 cm) in circumference. In Landscapes yarn, the brimless version of the Creative Preemie Hat is on the left and the main pattern is on the right. The girlie version in Shimmer on the left and Landscapes on the right. The hat in the front is a combination of both yarns. The Baby Hearts Hat, listed as Knitted Hat Pattern 2, by Heidi Gustad is a knit pattern that features heart shapes around the sides of the hat. I made the hat with the Shimmer yarn and skipped the pompom. It is shown below on a balloon that has a circumference of about nineteen inches (48 cm). 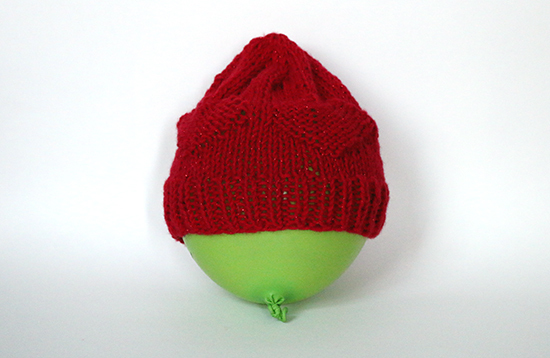 The hat patterns that I tried were all easy to make, and at such small sizes they worked up quickly. I’ll pick up more red yarn the next time I have a chance. Please click here to visit the Little Hats, Big Hearts website. You’ll find all of the information you need, including suggested patterns, how to donate yarn or money if you don’t knit or crochet, and how to participate if you live outside the U.S.
I’m not affiliated with the American Heart Association or The Children’s Heart Foundation, but I am an advocate for heart health. I hope this program continues to grow and helps little ones grow with healthy hearts. Thank you for participating in this program. DS2, we later found out, was born with a heart defect. I have another skein's worth of hats in progress! There's enough heart disease in our family that it's a selfish sort of giving. I hope that your son is doing well now. That sounds like a wonderful program! My grandson, now an 18 yr. old college student, was born with a heart defect and had surgery when he was 3 days old. It was touch and go for a while there, but all went well. He's now a delightful, caring young man and an excellent student. I'm so glad they were able to help him! It gives me renewed energy to keep supporting these organizations. Those little hats are so cute, and such a good thing to do. I'm not very good at knitting or crochet, especially hats. Yours are lovely! Thank you! They're fun to make.